THE HISTORY CHEF! : Ulysses S. Grant, the Transcontinental Railroad, and "Santa Fe Sage Broiled Hen"
Ulysses S. Grant, the Transcontinental Railroad, and "Santa Fe Sage Broiled Hen"
After the Civil War, peace between the North and South made it possible for the nation’s first Transcontinental Railroad to be completed. In 1863, the Union Pacific began laying track in Omaha, Nebraska, heading west. At the same time, the Central Pacific started laying track in Sacramento, California, heading east. Work in the beginning was slow and difficult, as you can imagine. After less than 25 miles of track had been laid in California, the Central Pacific “faced the daunting task of laying tracks over terrain that rose 7,000 feet in less than a hundred miles.” To conquer the sheer embankments, workers, the vast majority of whom were Chinese immigrants, were lowered by rope from the top of cliffs. While dangling in mid-air, they chipped away at the granite with picks and axes and then planted explosives to blast tunnels through the cliffs. Their wages, which are always paid in coin, at the end of each month, are divided among them by their agents…in proportion to the labor done by each person. These agents…furnish them their supplies of food, the value of which they deduct from their monthly pay. We have assurances from leading Chinese merchants that ...the [company] will be able to procure during the next year not less than 15,000 laborers. With this large force, the Company will be able to push on the work so as not only to complete it within the time required by the Acts of Congress, but so as to meet the public impatience. 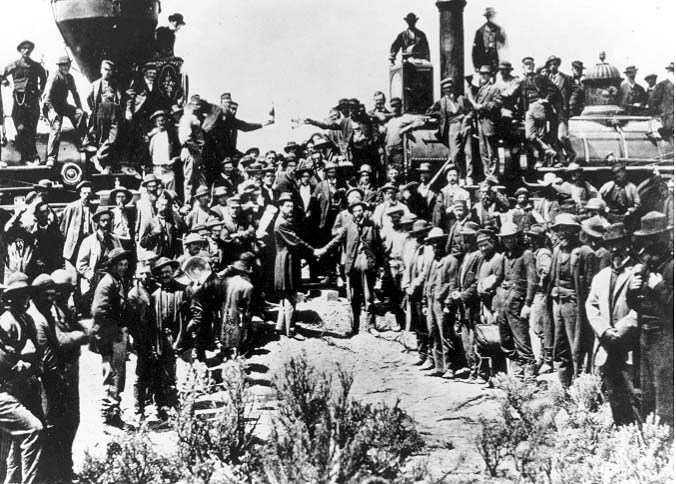 Four and a half years later, the two tracks finally met and the final “Golden Spike” was driven in with great ceremony at Promontory, Utah on May 10, 1869. By the end of the century, four more railways crisscrossed the United States. By then, most trains had luxury dining cars where first class passengers like President Grant dined on superb regional fare. The Baltimore and Ohio, for example, was famous for fresh seafood from the Chesapeake Bay while the Santa Fe was known for its Broiled Sage Hen and Prairie Chicken. Although those railway recipes would be difficult to duplicate today, you can try this simple recipe for Lemon Sage Roasted Chicken from Bon Appetit. Preheat oven to 450°F. Slide fingertips under chicken skin to loosen. Arrange 2 lemon slices and 3 sage leaves under skin on each breast; smooth skin over to enclose. Place chicken on rimmed baking sheet; brush with oil. Drizzle 1 teaspoon lemon juice over each breast; sprinkle with garlic, salt, and pepper. Pour 1/2 cup broth onto sheet around chicken. Roast chicken until brown and cooked through, basting once or twice with pan juices, about 25 minutes. Transfer chicken to platter. Place baking sheet directly atop 2 burners; add remaining 1/2 cup broth. Using back of fork, mash any garlic on baking sheet into broth and pan juices. Boil over high heat until broth reduces almost to glaze, scraping up browned bits, about 4 minutes. Spoon sauce over chicken and serve. FAST FACT: For every track of mile laid, railroads were granted a certain sum of money and 20 square miles of free land. The transcontinental railroad brought rapid economic growth to the nation, as farming, cattle-ranching and other agricultural businesses rapidly developed along the main lines.